Human rights groups have expressed concern over an apparent request by the Bahraini government for large quantities of tear gas. They say a leaked document shows a Ministry of Interior tender for 1.6m tear-gas projectiles, 90,000 tear-gas grenades and other equipment. 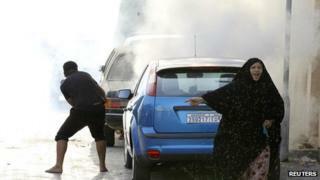 Campaigners have accused the Bahraini authorities of using tear gas as a weapon against opposition protesters. The Gulf kingdom has been rocked by unrest since February 2011. Opposition and human rights activists say more than 80 people have been killed in ongoing violence between security forces and protesters. The government puts the death toll lower, and says nine police are among those killed. Bahrain's majority Shia community has led the protests demanding reforms by the Sunni royal family. Tear gas is a generic term for a group of at least 15 toxic chemical agents that disable people by exposing their lungs, skin and eyes to irritants. CS gas is the most commonly used by for crowd control. The US-based Physicians for Human Rights (PHR) says tear gas has been a factor in at least 39 deaths in Bahrain since 2011. It alleges that tear gas is discharged in houses and public buildings, causing blindness, respiratory illnesses, miscarriages and sickle cell deaths. A report last year by PHR said civilians had also suffered serious wounds when their heads and limbs were hit by metal tear-gas canisters fired at close range. Campaign groups are urging the US, which barred the exports of tear gas to Bahrain last year, to speak out against the tender. Brian Dooley of Human Rights First, said: "Tear gas is being used in an indiscriminate, inappropriate and lethal way. The US should publicly oppose all sales of tear gas to Bahrain while it is being abused by the police." The Bahraini Government said allegations that the police had misused tear gas were false. "Tear gas is non-lethal and it is used appropriately by the police, in compliance with the law and in full adherence with [the] internationally-accepted standards," it said in a statement to the BBC.